This is the little painting that I started today. It is only 8 x 10 inches, done with acrylic used with water, and still a work in progress. This is an exploration because this is my first time painting on aquaboard instead of watercolor paper. So far, I like it. 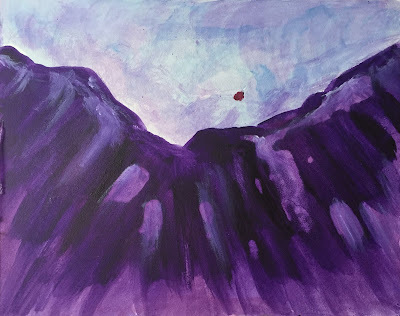 I am painting from my imagination, but as with my other "Mountain Daydreams," I am drawing from my memories of the mountains in my home state of Colorado.